My latest distraction is a fun web based “game” called TypeRacer, where you “race” against other typists in realtime who are all typing the same text which is often a quote from a book or song lyrics. 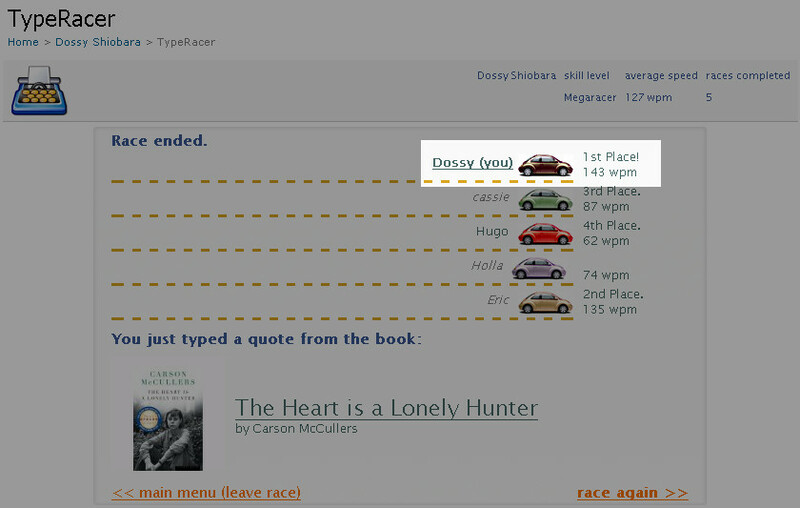 I love typing speed measurement games and TypeRacer’s social software aspect and multi-player nature really sets this apart. I’m also a huge fan of educational online gaming. It would be nice to select passages from educational texts to type against your friends–learn something while having fun typing. I’ve wondered whether there’s truly a better keyboard layout than QWERTY before and have yet to find any solid scientific proof. 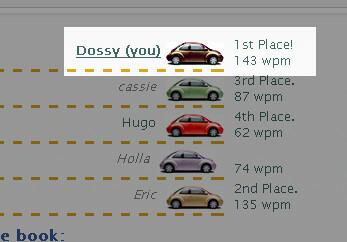 If Dvorak was measurably better than QWERTY, I would have expected to see two “bands” of scoring on TypeRacer: one of the varied QWERTY-layout typists, and a “break-away” group with speeds far above the rest who are master Dvorak-layout typists. Think you can beat me? Lets set up a type-off and see who’s got the fingers of fury! Bring it on!